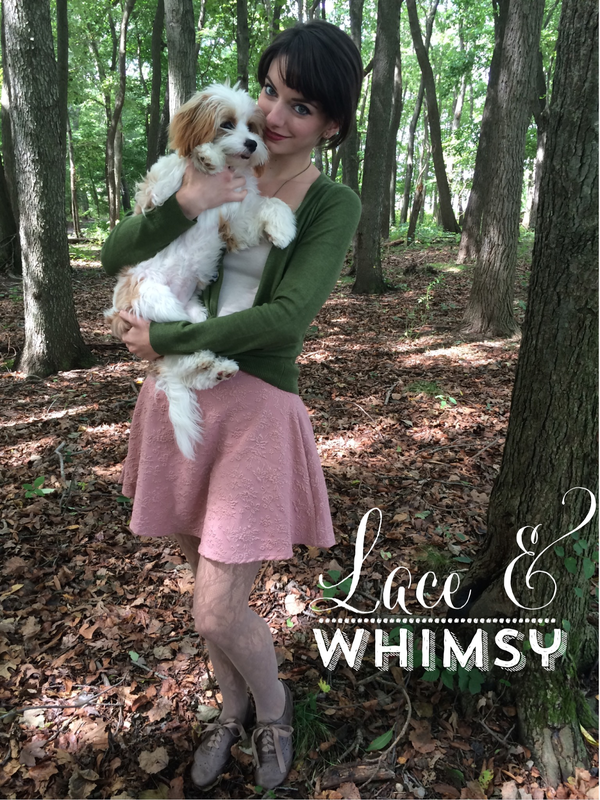 I'm super excited to introduce you all to Kathy from Lace and Whimsy! Her style is literally effortless, her blog is beautiful, hell, SHE is beautiful! 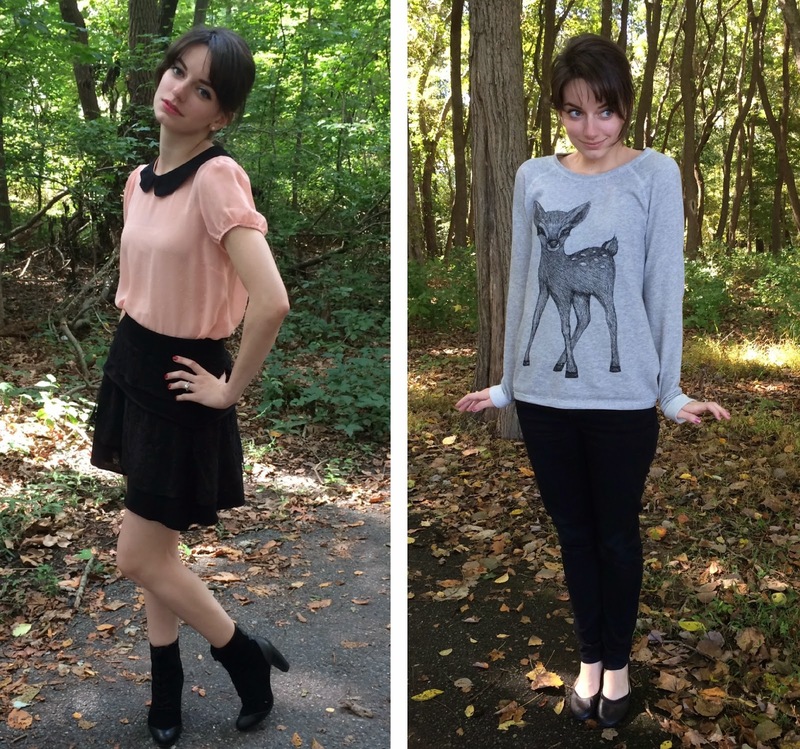 She's been a total sweetheart to me in blogging world and she's written a wonderful post about how her style and wardrobe has evolved over the years. 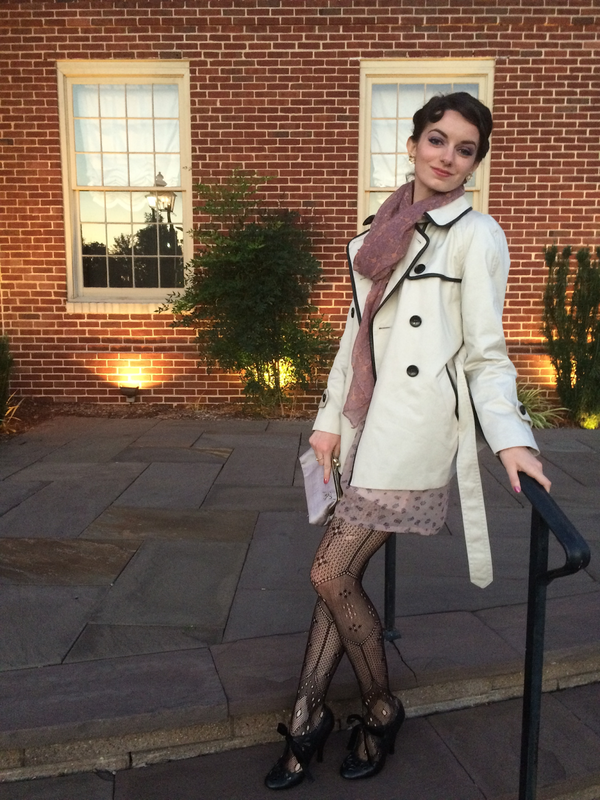 Without further ado, here is her guest post! Hello Demure readers! First I'd like to thank Lauren for inviting me to be a guest blogger. I've only been blogging for a few months so I was very excited when she asked me! Meeting awesome, like-minded, fashionable ladies such as Lauren has been a really cool perk of blogging! One of the main reasons I started fashion blogging is that I'm so proud of how my style has evolved over the past few years and what better way to show it off than through social media? I was always more of jeans and a tee shirt kind of gal. When I got my first hostessing job I panicked after I realized I had maybe two and a half appropriate outfits. Over the next few years I gradually "learned how to dress myself." 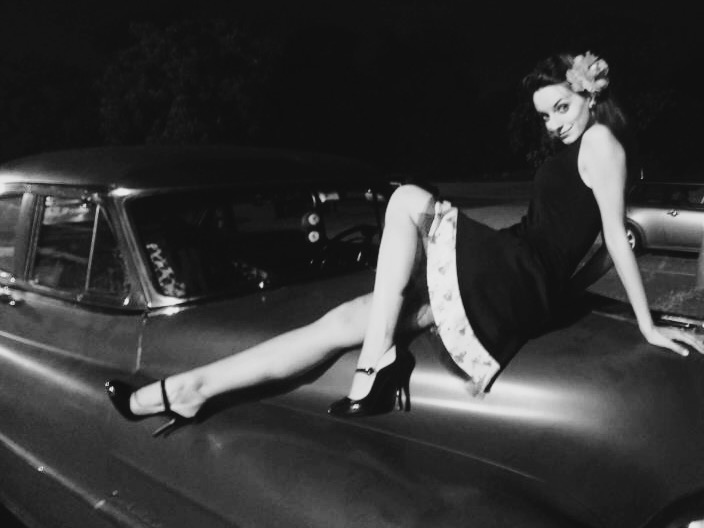 It wasn't until I discovered the rockabilly scene that I really started to have fun with my style. Growing up I would always admire the clothing in old movies and think to myself "why don't people still dress like that?" ...so imagine my surprise when I found out that some people actually DO. 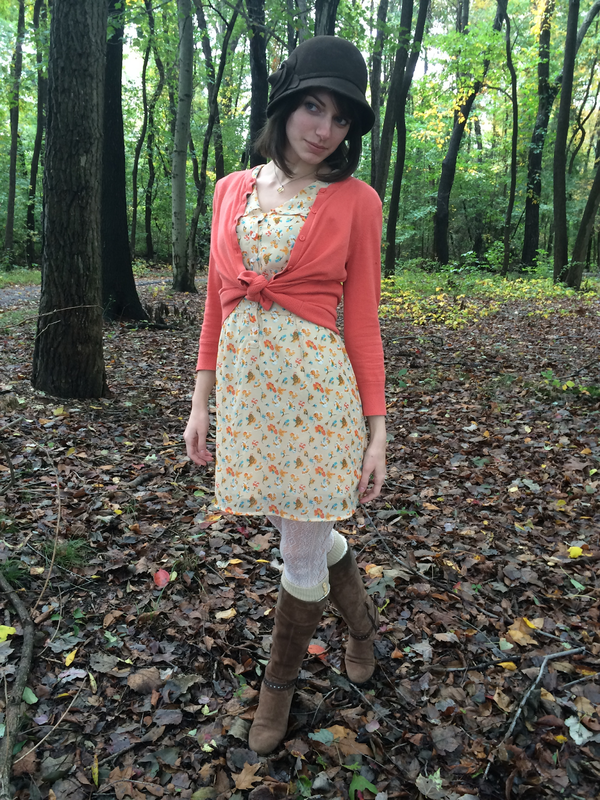 Shoes: ModCloth, Dress: Forever21, layered with a skirt I made. Fall of 2012 is when my style really took off. I was asked to do a photo shoot for Bloom, a local boutique. I loved the outfit that Mimi, the owner, put together for me and was blown away by how stylish I looked with my hair and makeup done while sporting a few unique accessories. I've done a few photo shoots for Bloom since, and I always learn so much from watching Mimi style an outfit. I've picked up a few tricks from her, like layering skirts with dresses. I was compensated for each shoot with a gift card to the shop, so I've been able to add a few really nice pieces to my wardrobe. Mimi carries some truly unique brands in her store. Lots of indie label clothing, fun accessories, perfume, candles, stationery, gifts, books and the most unique jewelry selection I have ever seen. You won't find any mass-produced jewelry! Just one-of-a-kind treasures made by designers in New York. One of my favorite lines she carries is "Miss Ellie". If you are ever in the Philadelphia area, come visit Bloom! Trust me, it's magical. A few months later I decided to get a pixie cut. Without my long hair to make me feel girly, I started wearing more makeup and wearing dresses more frequently. 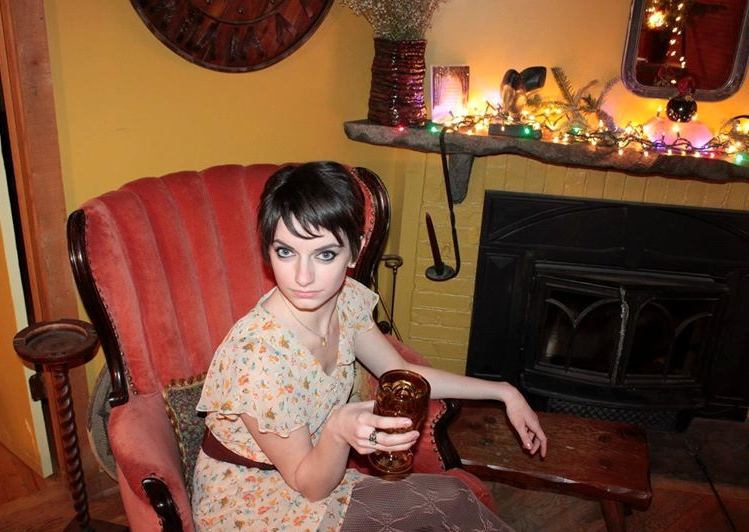 This was around the time my love affair with ModCloth began. Their amazing sales are a good way to build up a wardrobe fast. It continuously changes, but overall I would describe my style as modern with a vintage touch. I've moved away from the rockabilly-inspired looks and now just tend to buy pretty things that make me happy and then turn them into outfits. I'm drawn to vintage-inspired styles in soft feminine colors, and I'm a sucker for lacy or whimsical details (hence the name of my blog, Lace & Whimsy.) What do I mean by whimsical details? Think novelty prints and glittery accessories! I don't always play by the rules... I love mixing patterns and textures and adding little unexpected touches. It's fun remixing outfits to create something new from clothes I already own to keep things fresh. That's not to say I don't also enjoy shopping for new treasures from time to time (to time to time.) I also love thrifting! One of my favorite cardigans I found at Goodwill for $3! I've tossed it in the dryer countless times and it's still in great shape. I love clothes that don't need special attention. I'm so bad at laundry. Fashion for me is about having fun. It’s a creative outlet and a fun way to show off my personality. I certainly don’t take it too seriously or worry about what is currently in or out. I’m definitely drawn to timeless rather than trendy. That’s the great part about vintage-inspired pieces, they generally age well. I work full time as a bookkeeper for my father-in-law’s company. My husband works there too, which works out well for blogging purposes because I have him take photos of my outfits during our lunch hour. I get a little jealous of fashion bloggers that always seem to have the time for fancy outfit photo shoots. Luckily for me, there’s a park with a trail through the woods just behind our office. The trees make for a lovely backdrop for photos! "Do what you can, with what you have, where you are." I’ve really enjoyed my experience blogging so far. I’ve “met" so many wonderful ladies! Like Lauren, I try to keep my more politically charged views separate from my fashion blogging persona. I think blogging has been a healthy outlet for me to express myself in a positive way and take a step back from getting too wrapped up in political and social issues. It’s good to compartmentalize! I hope you enjoyed learning a little about me and my style. Thanks again for hosting me, Lauren!